Taking cue from design elements seen in automotive shows the past year, I found it interesting how decoration for interior and exterior trim can be enhanced by changing the scale and structure of pattern elements with geometric shapes. This is a perfect way to customize surface decoration for aluminum trim! This is a visual enticement that can draw a person in to take a second look. The graduated scale of the shapes opens the door for all kinds of customization with surface decoration for aluminum trim. 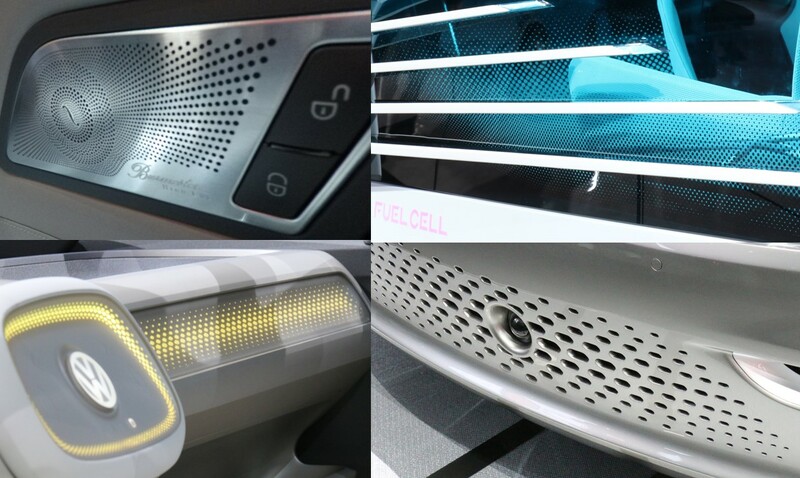 Just as seen on the concept cars at the auto show, finish development can be explored to follow the contour of a door rail or dash panel. The possibilities are endless when you consider that in addition to picking a geometric shape that there is a whole spectrum of colors and all of their variances to choose from. There is opportunity to be as bold and bright or as subtle and low-key as you want. Ready to start exploring options in customizing a finish for your next decorative trim project? Let's talk! Editor's note - this post originally was published in our Design Blog February 3, 2017. It has been updated and refreshed to fit the objective for the Trim Blog and your enjoyment.